M.A. film student Dalina Perdomo-Álvarez reflects on her experience working as a gallery attendant and researcher at the Stanley Museum of Art and how this experience helped her to secure a positions a curatorial assistant the Museum of Contemporary Photography in Chicago and as a distribution assistant at Video Data Bank at the School of the Art Institute of Chicago. Image: University of Iowa graduate and UI Stanley Museum of Art staff member Lindley Warren and UI MFA student Jacob Jones join Stanley Curator Joyce Tsai in showing Lena Stringari, deputy director and chief conservator of the Solomon R. Guggenheim Foundation, around the museum’s Visual Classroom in the Iowa Memorial Union. 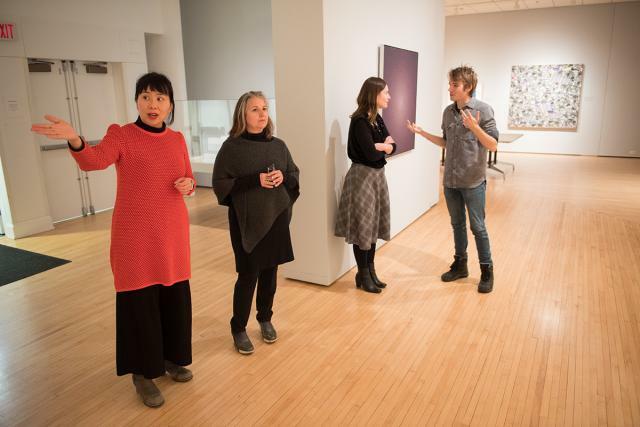 UI students who work in the Stanley and with its curators have the opportunity to make valuable connections with the professional art world. Photo by Tim Schoon.